It has been a slow emergence from the cocoon this winter season as I ground into my new home state of North Carolina. Now we’ve passed the New Year, Imbolc on February 2, the mid-point between Winter Solstice and Spring Equinox in the Celtic tradition, and the start of the Chinese New Year-the year of the Pig. If you’re this sign as well, visit this link to learn more. Looks to be an auspicious year! There are stirrings of creative energy around the coming season of rebirth as trees begin to bud and bloom here. Perhaps you’re feeling this impulse, too? New paintings are percolating, several are in process, and I recently completed the painting above. When I first painted in the golden crown, I wasn’t clear why until I deepened into the piece. An ancient Sumerian goddess, Inanna’s underworld journey is an archetypal symbol of transformation and rebirth. I first discovered her 18 years ago during another time of deep transformation and if you would like to learn more about her, this is a great text. Here, she emerges from the yoni, or womb, of the Vesica Piscis, the two intersecting triangles that are considered the “seat of creation” in sacred geometry. One circle representing the transcendent/Sacred and the other, the material/profane. 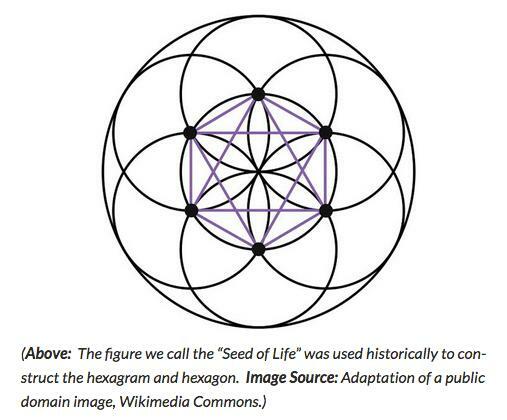 Two circles lead to seven intersecting triangles that become the “Seed of Creation.” This being the foundation for the six-pointed Star of David in Judaism, the Seal of Solomon in Islam, the Shri Yantra in Hinduism, and the hexagram that appears throughout Nature, like the honeycomb seen here in the painting. I’ve also been in the process of looking for a new home and studio space and am scheduled to close on a new property March 19, right in line with Spring Equinox. This is the photo below of the converted garage that will be the new home of Sacred Art Studio, based in Raleigh. I continue to feel profound gratitude for your support of this holy ministry and Mother Earth for her beauty and abundance. I’m also feeling hopeful these days with the changes in our Congress and the growing climate awareness/actions especially from our young people. They need our support for their future! As always, I welcome your thoughts.